Chris Dennis is the CEO of the Alzheimer Society of Ontario. Even though I ran half a dozen marathons in my youth, 20 years on preparing for number seven wasn’t as easy as I thought. 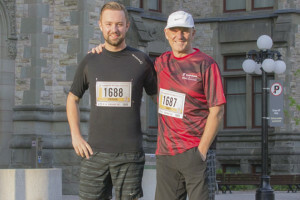 Since I received my son’s ‘Christmas gift,’ which entailed signing us both up for the Ottawa Marathon six months down the road, I have trained through rain and snow. And then, just to add a little pressure, I decided to turn my run into a fundraiser for Alzheimer’s disease research. Why have one challenge when you can have two? There have been bumps along the way. In addition to the coldest February on record, my doctor diagnosed me with bronchitis a week before the race. But with a puffer and some meds, he sent me on my way. I was ready..err sort of. And with so many people rallying behind my fundraising effort, I more than doubled my goal and raised $13,000. Expectations were high and I didn’t want to let everyone down. On May 24, I ran my marathon. It was gruelling and a lot slower since the last time I completed one. Having never cramped up in my entire life, I got my first at the 13 km mark. Such fun! Four hours on the pavement is a lot more difficult than the three I used to clock in days past. 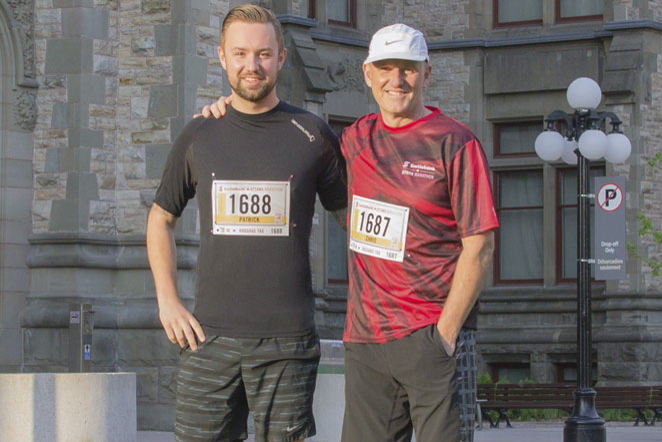 And my son beat my time by 40 minutes, leaving no doubt that the torch has been passed. I ran my race but will stick to 10 kilometre races for the future. But it’s an experience I won’t soon forget.